On Sunday the ASRC in partnership with Islamic Council of Victoria, Halal Food Bank and Maidstone Mosque held a ‘Share Love and Solidarity’ event for Christchurch community. The community were invited to bring non-perishable food into the ASRC garage and to sign condolence books for families and communities of those lost to Christchurch terror attack. The ASRC CEO Kon Karapanagiotidis hosted the event, greeting people at our doors and welcoming special guests. Volunteers and staff collected and sorted food and loaded into cars of Halal Food Bank. Children made beautiful drawings and adults had a chat and took photos for social media. Tris Mardiastuty from board of Islamic Council of Victoria, Laalanne and Ahanie from Halal Food Bank and Ahmed from Maidstine Mosque participated in greeting community and loading food. Very special guests Father Bob and Sheik Rabee of Maidstone Mosque dropped in and talked with us. All captured on ASRC Facebook live stream. Lalaane and Ahanee said they had enough food to operate the Halal Food Bank for 6 months. People from all faiths and walks of life attended with bags of food and heartfelt messages for Christchurch communities. Many tears and words of love, hope and connection were shared. All community leaders and members were deeply moved and uplifted by the experience. 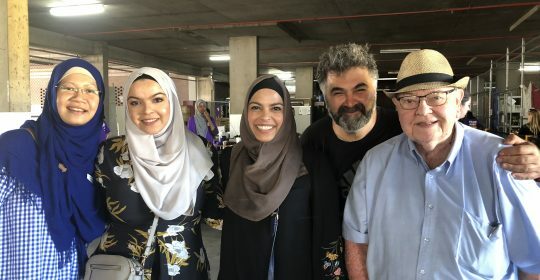 The ASRC supports many people seeking asylum from Muslim faith and we are dedicated to supporting and celebrating our rich multicultural city with community partners. Help provide food security to over 700 people each week by donating to the Asylum Seeker Resource Centre’s Foodbank today.